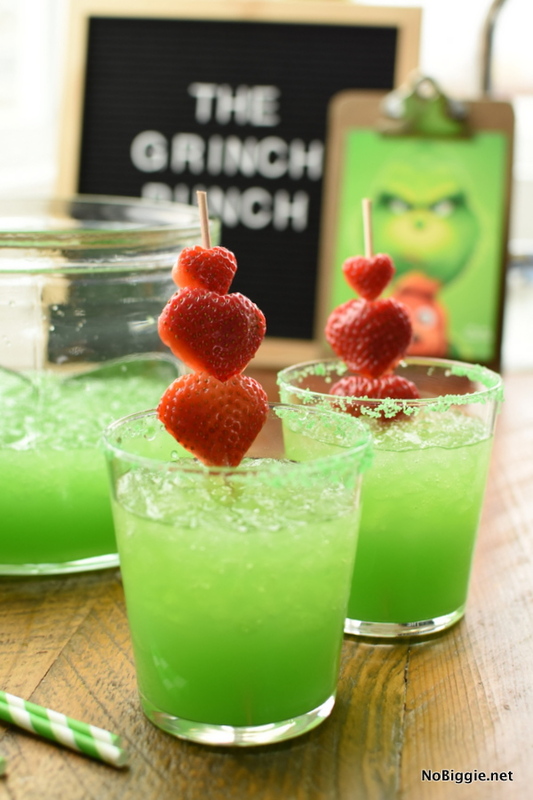 We love the classic story of The Grinch, and this Grinch Punch is a must at your next Christmas party. Who can deny the sweet story and the true message of Christmas behind the story of The Grinch? It’s so timeless. If you are planning a themed Christmas party this year, you should plan a Grinch themed party…it would be a hit! 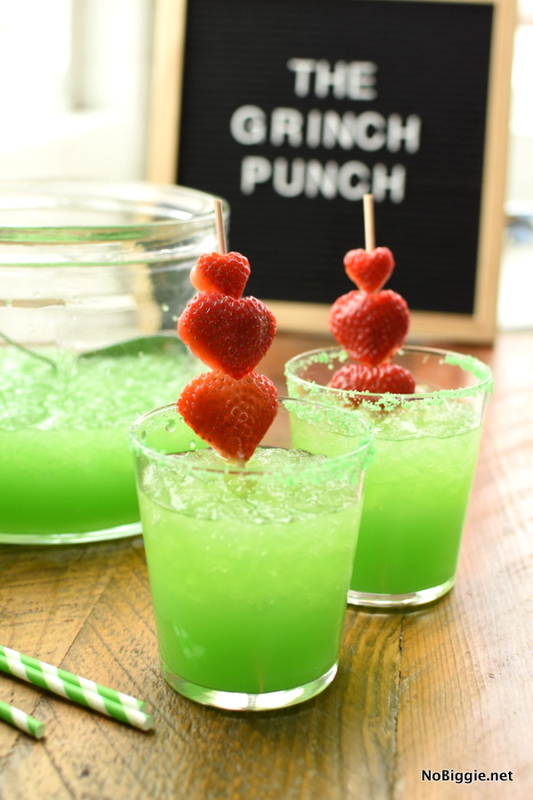 This deliciously green Grinch party punch is so fun and festive, kids AND adults will love it! Add a green sugared rim to the glass for another pop of green. You could also do a red sugar rim too! 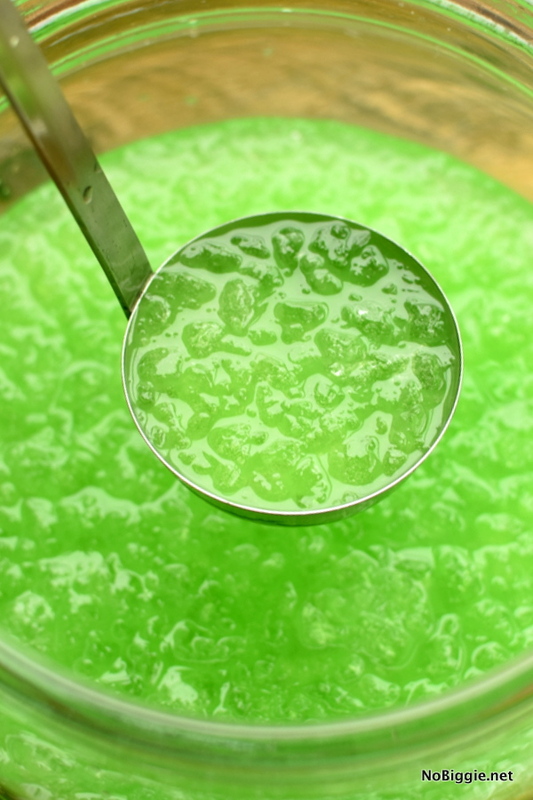 If you can’t find green sugar in the store, you can make your own green sugar by blending granulated sugar with green food coloring until you get to the desired color. You can also try green apple fun dip for a more tart flavor. We love the green rim for a festive touch. To make the strawberry heart garnish, you can use a knife or a tiny heart shaped cookie cutter. Then just slide them onto a wooden skewer. Three strawberry hearts, each one a bigger size, just like the Grinch’s growing heart! How to make a green punch? 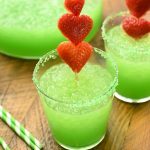 There are a few different ways to make a green Grinch drink or punch, but we love this recipe because the green color is so vibrant and the pineapple juice adds the best flavor. The key to any great party punch is pebble ice. You can often find this kind of ice at your local gas station, Sonic Drive Thru, or even the meat department of your local grocery store. Give your punch a refresh during the night of your party, by adding in remaining ingredients when needed. Store the rest of the ice in the freezer and add more ice through the party when needed. The ice will melt and help dilute the juice concentrate and the Kool Aid. Serve with a ladle to ensure everyone gets lots of pebble ice in each glass. 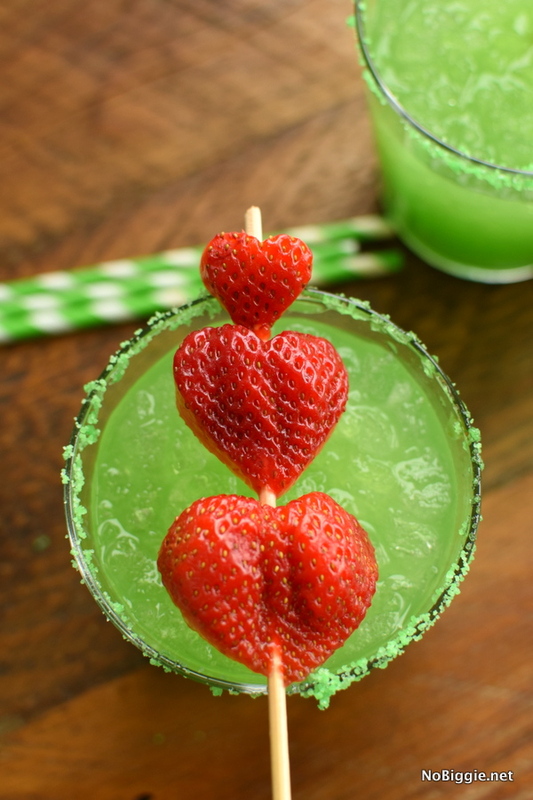 Garnish with a green sugar rimmed glass and a strawberry heart (or hearts) on a skewer. It’s always fun to serve a delicious punch during the Christmas time, especially a green non alcoholic punch that the kids will love. We hope you love this punch as much as we do! 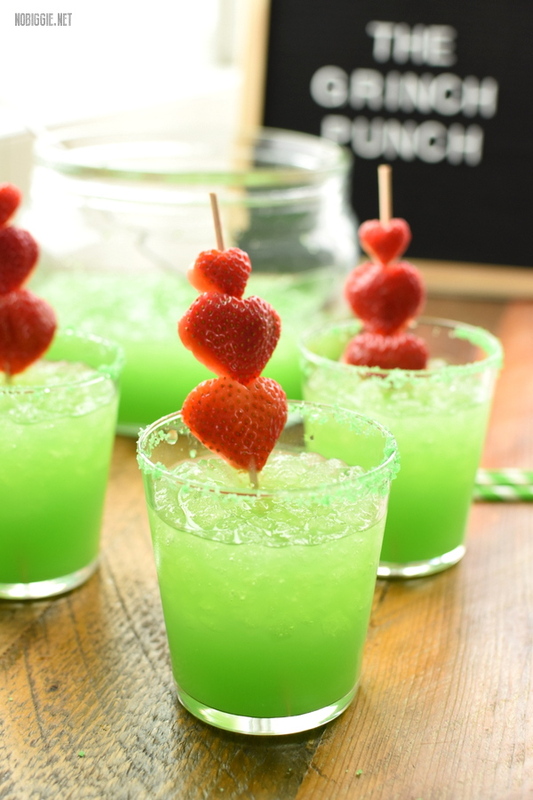 Serve up this festively green Grinch Punch at your next Christmas party, and don't forget the good ice! In the serving bowl, mix together 1/4 of the green Hawaiian Punch with the full packet of lemon lime Kool-Aid along with 1/2 of the container of frozen pineapple juice. Add about 1/3 of the bag of pebble ice and mix to combine. Add 1/2 of the 2 liter of Sprite and stir to combine. Store the rest of the ice in the freezer and add more ice through out the party when needed. The ice will melt and help dilute the juice concentrate. 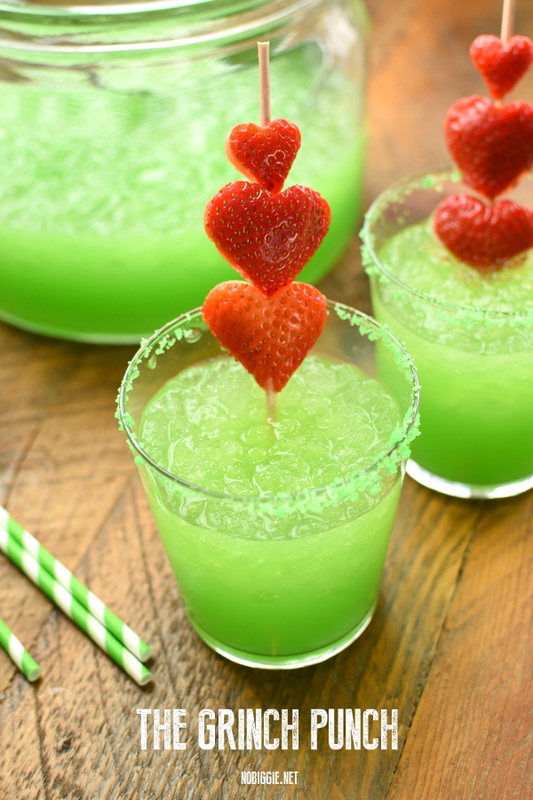 Garnish with green sugar on the rim of the glass and strawberry hearts on skewers. You can add in the remainder of the ingredients throughout the party as the punch gets low. To make the strawberry hearts, cut the strawberries in half from top to bottom and slide them onto a skewer. You can trim the skewers with heavy duty scissors if the skewers are too long.